The Fire Buster II was the second, upgraded version of the Fire Buster used by Eudial in the anime. Eudial called out "Fire Buster" (ファイヤー・バスター) as she used it, and its fire attack overpowered Moon Spiral Heart Attack and could not be put out by Sailor Mercury, though Super Sailor Moon was able to repel it with one hand. This version also came with a glue-gun attachment that Eudial used to trap the Sailor Senshi. 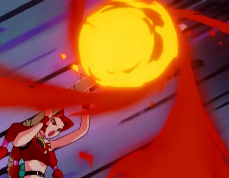 In the Spanish dub, Eugenia claimed that the Fire Buster II became more powerful each time it was fired, while in the original she simply stated it was a more powerful version of the original Fire Buster. This page was last edited on 24 May 2015, at 10:56.